RUSH: Breitbart went back to the news archives, back to last October. 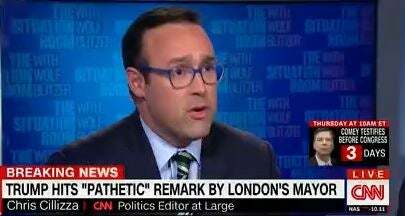 Chris Cillizza, we like Chris Cillizza. He’s innocently wrong. There are certain members of the Drive-Bys that are not viciously mean-spirited; some just accidentally swerve into it. Cillizza is one. He’s a likable guy. He’s wrong like most of the Drive-Bys are wrong on pretty much everything, but never knows it, doesn’t really care. He’s doing what he has to do to stay in everybody’s good graces. And he had a piece on the CNN website last October. Trump at the time had suggested that it was the Democrats and Hillary, the FBI and Russia were all behind this Russian dossier. And Cillizza wrote a piece claiming that Trump was bonkers and crazy for suggesting it. That it was irresponsible, it’s just not good when a president turns on his own FBI and turns on the Democrat Party like this. And to say that the Steele dossier came to be the work product of the Clinton administration, Hillary Clinton, the DNC and all that was just absurd. Turned out to be exactly right. In fact, we might want to start calling it the Hillary dossier because that’s exactly what this thing is. And remember it’s the same when Trump alluded to the fact that his wires were being tapped at Trump Tower. And they had the same reaction. Now we know that that was happening, in an indirect way, but we know it was happening. So the Drive-Bys are routinely proved wrong when they proclaim Trump as an idiot and a danger and doesn’t know what he’s talking about. To the audio sound bites we go. This is Ron Brownstein, CNN’s New Day today, and he’s also the — I didn’t know this — he’s the senior editor for the Atlantic. I thought Brownstein — well, he used to be at the LA Times. I forget where he went after. These people travel around. It’s a revolving door. All these Drive-By publications, The Atlantic, Los Angeles Times, New York Times, Washington Post, Politico, TheHill.com, Slate, you name it, I mean, one week they’re writing for one place; next week they’re writing for another. I wonder how these people keep their tax deductions straight, all these different employment records, change jobs that often. Okay. So he’s the senior editor of The Atlantic and he’s on CNN today. And he’s talking about Republicans, focusing on the text message between Strzok and Lisa Page, the text message where she says Obama wants to know everything. And here’s his input on this. BROWNSTEIN: You have a Republican Party that is following the Trump lead of kind of losing interest in talking to the broad country and feeling on anything to do with Russia and the Russia probe that it is simply enough to just throw out anything over talking points of conservative media. This is all about kind of energizing the base. There is evidence in polling that they are turning portions of the Republican base against the FBI. BROWNSTEIN: The (unintelligible) the FBI’s position (unintelligible) alternative reality. RUSH: No! Say it isn’t so! They’re in a panic. “You know, it’s really true, Trump is turning parts of the conservative base against the FBI. Oh, my God, this is horrible, we can’t have this happen. 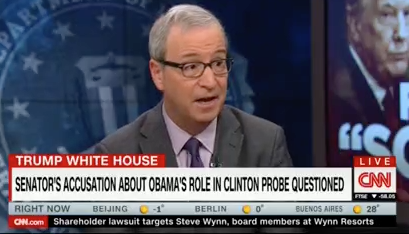 Do you realize this –” The reason I play this sound bite following the story, Trump was exactly right late last year when he said the dossier was the work product of the DNC and Hillary Clinton, and guys like Brownstein pronounce Trump idiot, dangerous, this is dangerous to say this kind of stuff. And then the Nunes memo comes out and makes it clear here that the dossier has no basis in fact, the FBI knew it. And so now of course the problem is want what happened to the FBI, the problem is not the dossier, the problem is not the dossier’s pack of lies, the problem is not that it’s a political opposition research document that was used to grant a spying warrant from the FISA court on the Trump campaign. No, that’s not the problem. The problem is that Trump is irresponsible and dangerous, he’s turning his deranged lunatic supporters into being against the FBI. And this deterioration the FBI, this is horrible. These guys have been in a bubble since the day Trump came down the escalator. The day he came down the escalator and the day he announced, they have been in a bubble, and they have not yet gotten out of it. I mentioned that on Tuesday afternoon right after the program I went over and did an appearance for the National Review Institute. And one of the things — I forgot, there was a question either from the moderate, Andy McCarthy, or from the audience, I can’t remember which, but my answer to it was, I stood up, got out of the chair. I said, “You get the message to him somehow. I forget who I was even — I think I sent the email to Hope Hicks, that’s what it was, and I got a return from Kelly Conway. But anyway, I didn’t have any doubts precisely because I understood the bond that Trump had created and was going to create with his supporters. And that’s what these people still don’t get. And they’re never going to understand it because they’re never going to experience it. They’re never going to have a bond with their audience like Trump has with his supporters or I have with you in this audience. As such, they can’t understand it. And so, in their view, anybody to this day who still supports Trump has gotta be sick. Anybody that still supports Trump has to be deranged, somehow, has to be emotionally not right, psychologically unbalanced. And therefore it is dangerous what Trump is doing. Trump is actually succeeding in turning some of his supporters against the FBI as though that is simply unacceptable. And what they don’t understand is that Trump’s got nothing to do with that. What is happening to Trump is why people are turning against the FBI. And they’re not turning against the whole thing. They’re not turning against the whole organization. But these people that support Trump, you people in this audience can think for yourselves, and they’re not mind-numbed robots being driven down the road and told what to say or even what to care about. They are deeply aware, fully informed. They know full well they have enough information on their own to be suspicious of this entire investigation. They know full well what it is. It’s an effort to throw Trump out of office. It is an effort to overturn an election. But people like Brownstein can’t possibly think that you could come up with that on your own. The only way you could think that, ’cause it’s so not true, why, they’re just trying to defend the Constitution. They’re just trying to defend the FBI. They’re just trying to defend law enforcement and government in general. And Trump is being dangerously irresponsible by telling his people the FBI is the problem in Washington. I’m sorry, Mr. Brownstein, but Trump voters know that without being told. They think it without being told. You know why? Because they can see. Because they can read. I dare say that your average Trump voter probably knows more about this investigation and all angles of it than people like Brownstein knows. Because Brownstein and others will shut themselves off from media reporting certain facts on this. Those certain facts, the Drive-Bys, the left, the Democrats, don’t even want to entertain because they’re not legitimate. So now it’s dangerous what Trump is doing. And it’s not just Trump. The Republican Party, following the Trump lead, losing interest in talking to the country at large, simply trying to drum up opposition to the FBI. They are talking to the country at large. Mr. Brownstein, there’s an attempt here to persuade as many people as possible what you refuse to see or report. Here’s Don Lemon, CNN last night, and this is about his idea for a news network, and Ryan Lizza is on this bite. LEMON: I shouldn’t give my idea away, but there should be a network that is devoted to just going through the opening monologues of conservative media and fact-checking them every single night to debunk — I watch and I cannot believe this. No one is fact-checking, everyone is on same page. They load the deck with people who support them. They never have a dissenting voice. It’s really unbelievable, and many Americans believe the bull crap that they’re spewing. RUSH: This is fascinating. Take the fact that it’s Don Lemon out of it. Here’s a guy that not only works at a network, but is a guy who is totally blind to any opposing view. He is in fact exactly what he’s accusing us of being. There’s nobody fact-checking their monologues. They don’t have anybody from the opposition on very often, and when they do, they belittle them, they outnumber them four to one. No one’s fact-checking, everybody is on same page, they load the deck with people who support them, never a dissenting voice. He’s describing the way CNN operates, but he doesn’t see it. In his world, he is the pinnacle of objective journalism, the pinnacle of it, and all of CNN is. I mean, forget for a moment the partisan nature. To me it’s fascinating the two Americas that we have with nothing in common. There’s no bridge. There’s no way to get from one side to the other. Don Lemon hasn’t the slightest capability of understanding what he hears in a conservative monologue. He doesn’t have the ability to understand it. The fact that there is a point of view other than his own is all he needs to know to reject it. And fact check conservative monologues? Have you ever heard of Media Matters for America? You know what, Mr. Lemon, they have to lie about us when they fact check our monologues. They have to make things up and lie to people about what we’re saying because they can’t refute. And that’s why there isn’t any fact-checking, Don. You guys really can’t refute us idea to idea to idea. So you don’t even want to take us on in that realm. But just the existence of these obvious two Americas and how do they ever, ever get put together? How is this gap ever gonna be bridged? Because, folks, it is widening. We’re not getting closer together. We’re getting further away. And because that’s the reality, it’s why I keep telling people, it’s a fool’s errand to try to compromise with them. They have to be defeated. And they have to be defeated every day. RealClearPolitics: Don Lemon: Conservative Media Only Have Guests That Support Them, "Never Have A Dissenting Voice"